Stephanie Baucus, an attorney in Billings who helped found the Yellowstone County Area Human Trafficking task force, testifies in support of Senate Bill 147. Photo by Shaylee Ragar / UM Legislative News Service. 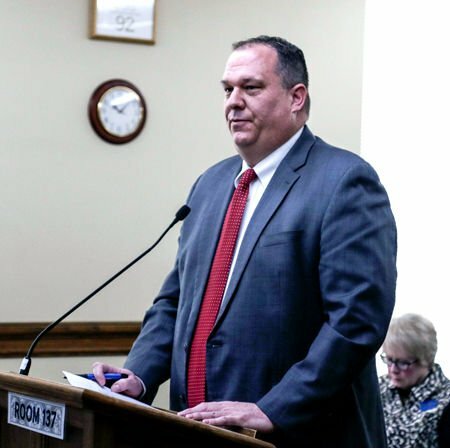 Rep. Daniel Zolnikov, R-Billings, is carrying House Bill 749, which aims to crack down on criminal massage parlors that use the business as a front for forced prostitution. Sen. Margie MacDonald, D-Billings, is carrying Senate Bill 147, which would make penalties harsher for human traffickers and change consent laws. Photo by Shaylee Ragar / UM Legislative News Service. Missoula detective Guy Baker investigated and a caught a pimp for the first time in 2010, and the man was prosecuted for human trafficking. But, he didn’t get a prison sentence. Another bill aims to enhance regulation of massage parlors and complements the efforts of McDonald's proposal.